Multifunctional Laser Pointer Infiniter 4 in 1 with integrated PDA stylus, ballpoint pen, LED torch and laser. 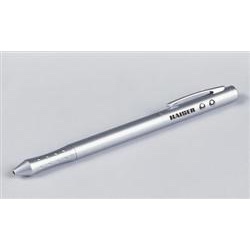 Silver coloured, innovative design with top quality ball point pen. Complete with batteries and case. Laser pointer for beamer presentations, slide, film and overhead projection, screen presentations, and non-contact pointing in research, medicine and industry. Range approx. 100 m (300 ft.). The light spot is clearly visible, also in daylight. Wave length 625-680 mm, output power < 1 mW, safety class 2. Additional functions: a white-light LED pen light, a ball pen and a PDA stylus pen can be selected for operation by turning the front section of the pointer. The reverse end of the PDA stylus can be used as a reset tip tool. Stylish, matt-finished chrome-plated brass body in ball pen shape. Supplied with batteries (4x 1.5V AA) and metal box.